Besides it being a lyric in one of my favorite REM songs, apparently the Mayans are predicting the world's end on this year's winter solstice, December 21, 2012. Unfortunately, we can't exactly talk to the leaders of the Mayan Empire because they were conquered in the mid-1500s. I decided to do a little research to figure out how an extinct group could predict the end of the world, when their world had already ended. Surprisingly, they are a tenacious bunch, so I'm not counting them out yet. In 1461 the capital Mayapan was abandoned following 20 years of political infighting. Sixteen rival Mayan factions fought among themselves for power. In 1517 the Spanish arrived and battled the Mayans. The Mayans defended themselves admirably, only to start dying from western smallpox, influenza and measles. Over 90% of the Mayans were wiped out by disease. In 1541 the Spaniards finally subdued the Mayans, although the Mayans continued to revolt through the end of the century. In 1697 the Spaniards toppled the last Mayan capital and the Mayans as a political entity cease to exist. It wasn't until 1839 when amateur archaeologists conducted a series of explorations that we even recognize the extent and splendor of the classic Mayan civilization. In fact, they had abandoned their great cities. 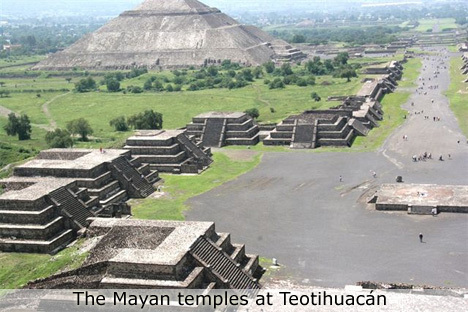 An unknown event destroy their largest civilization at Teotihuacan around 600 A.D. In 899 A.D. the largest remaining city of Tikal was abandoned. 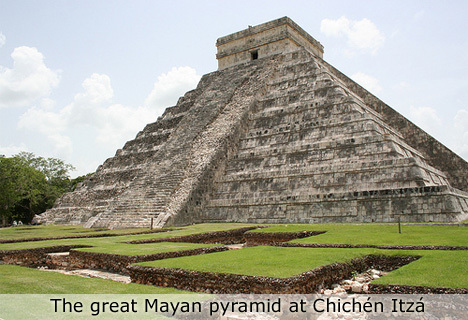 In 1244 Chichen Itza was abandoned for reasons unknown. The people lived in nomadic fashion for 18 years before founding Mayapan. By my count, the Mayans' world had already ended seven times by 1700, more than a century before modern society even recognized them as a civilized people. Ironically, the Mayan people are still around. In 1992 a woman named Rigoberta Menchu won the Nobel Peace Prize for speaking out against death squads in Guatemala trying to exterminate the Mayans. In 1994 three groups of ethnic Mayans rose up against the Mexican government and took the city of San Cristobal de las Casas. The way I figure, the Mayan world has ended more than half a dozen times, but it's still around. If December 21, 2012 really is the end of the world, I suspect a bunch of Mayans will be the only survivors, and will probably repopulate the earth.